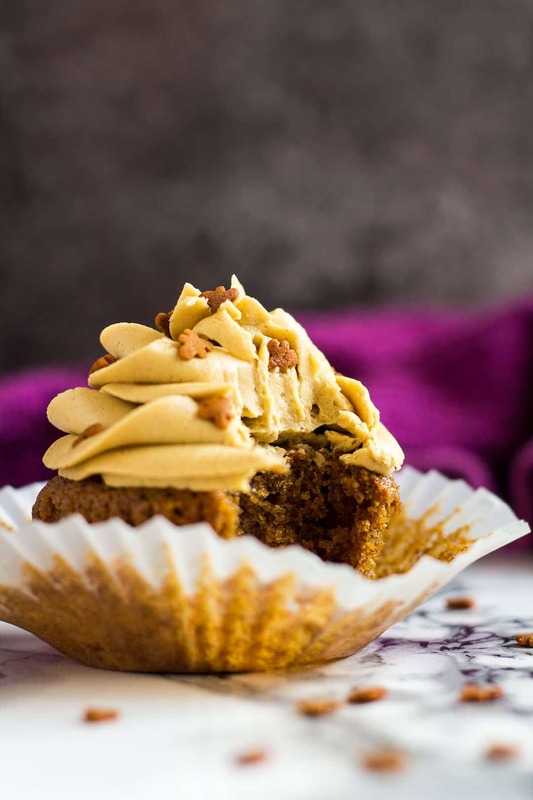 Gingerbread Cupcakes – Deliciously moist and fluffy gingerbread cupcakes that are loaded with flavour, and topped with a ginger buttercream frosting! One of my all-time favourite winter/Christmas flavours is gingerbread. I love ALL the gingerbread recipes! 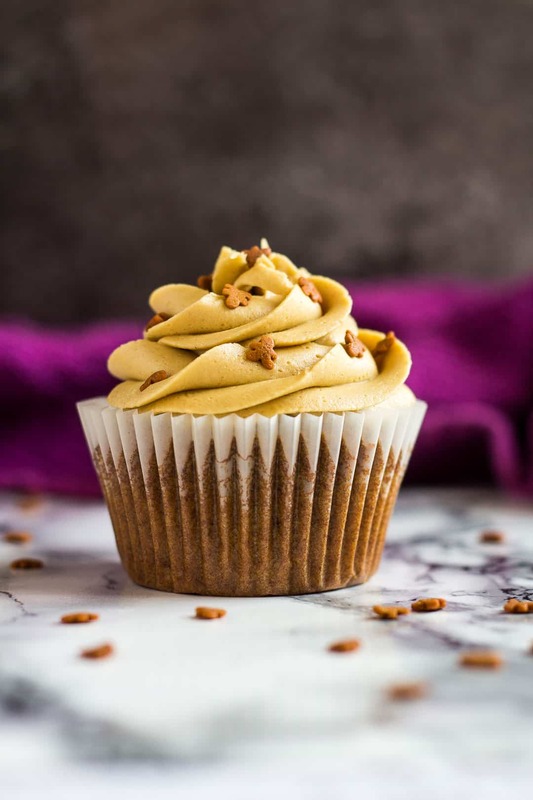 That goes for classic gingerbread, cake, cookies, truffles… Oh, and these incredible Gingerbread Cupcakes! 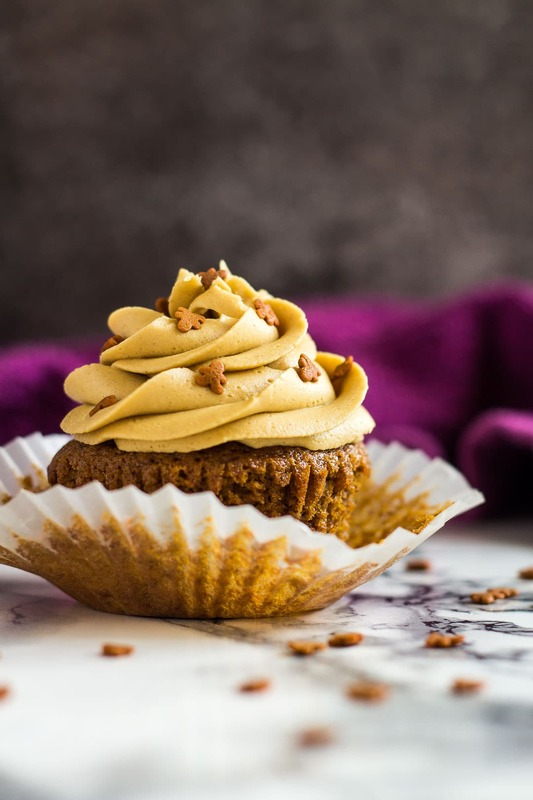 These cupcakes are SO incredibly moist and fluffy, and full of warm, cozy flavours, including ginger, cinnamon, nutmeg, and molasses. They’re topped with a sweet, creamy ginger buttercream frosting, and festive sprinkles. Aren’t those mini gingerbread men so cute?? Cake flour: See recipe notes below on how to make your own! Molasses or black treacle: NOT blackstrap. 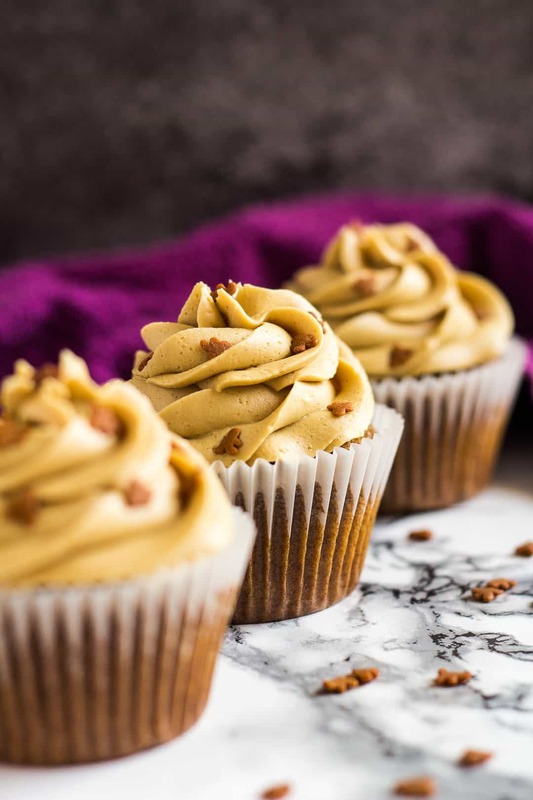 To make these cupcakes, simply whisk together the flour, baking powder, baking soda, salt, and spices. Set aside. In a separate bowl, whisk together the eggs. Add the sugar, and whisk until combined. Add the butter, yogurt, and molasses, and whisk until combined. Fold in the dry ingredients until smooth and combined. Divide the batter evenly between a muffin pan lined with muffin cases, filling only 2/3 full. Bake for 15 – 17 minutes, or until a toothpick inserted into the centre comes out clean. Allow to cool slightly in the pan, before transferring them to a wire rack to cool completely before frosting. For the frosting, beat the butter until pale and creamy. Add half of the icing sugar, and beat until combined. Add the remaining sugar and beat until combined. Add the molasses, milk, and spices, and beat until fluffy and spreadable. Transfer the frosting to a piping bag, and frost the cooled cupcakes. Top with some festive sprinkles. perfect for Christmas or any time of the year! What molasses should I use in these cupcakes? I would recommend using light or true molasses, which is much sweeter, and lighter in flavour than blackstrap molasses. Blackstrap is too strong and bitter, and will overpower the other delicious flavours. If you’re in the UK, black treacle works just fine, too! How long will these cupcakes last? These cupcakes can be stored, covered tightly, in the fridge for up to 3 days. Can I freeze these gingerbread cupcakes? Yep! Frosted or unfrosted cupcakes can be frozen for up to 3 months. Thaw overnight in the fridge. 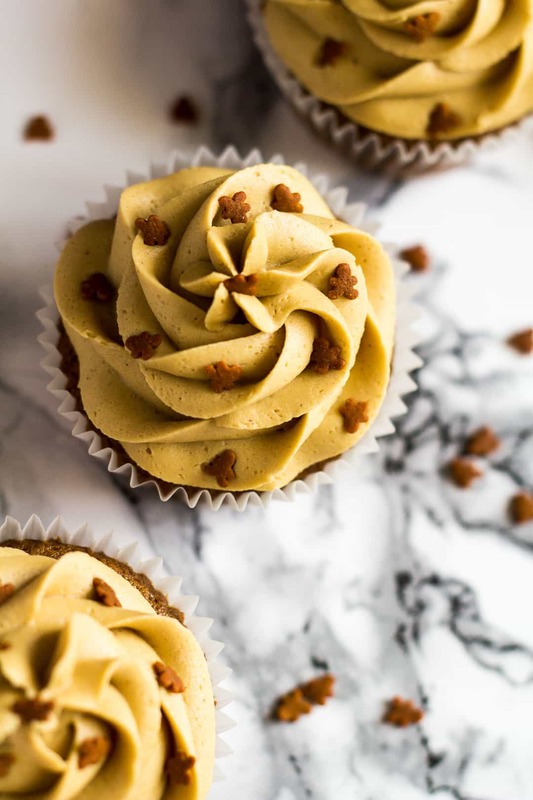 Deliciously moist and fluffy gingerbread cupcakes that are loaded with flavour, and topped with a ginger buttercream frosting! Whisk together the flour, baking powder, baking soda, salt, and spices. Set aside. Whisk together the eggs. Add the sugar, and whisk until combined. Add the butter, yogurt, and molasses, and whisk until combined. Fold in the dry ingredients until smooth and combined. Divide the batter evenly between the muffin cups, filling only 2/3 full. Bake for 15 - 17 minutes, or until a toothpick inserted into the centre comes out clean. Allow to cool for 5 minutes in the pan, before transferring them to a wire rack to cool completely before frosting. Using a handheld or stand mixer, beat the butter until pale and creamy. Add half of the icing sugar, and beat until combined. Add the remaining sugar and beat until combined. Add the molasses, milk, and spices, and beat until light and fluffy. Transfer the frosting to a piping bag, and frost the cooled cupcakes. Top with festive sprinkles! *Make your own cake flour! Measure out 1 and 1/2 cups (187g) of plain/all-purpose flour, remove 3 tablespoons, and replace with 3 tablespoons of cornflour/cornstarch. Sift well. **Light or true molasses is much sweeter than blackstrap molasses (which is very bitter), and is much preferred in baking. Black treacle is also fine to use. 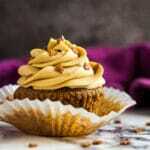 Leftover cupcakes can be stored, covered tightly, in the fridge for up to 3 days. Frosted or unfrosted cupcakes can be frozen for up to 3 months. Thaw overnight in the fridge. Cupcakes can be made 1 day in advance, covered, and stored at room temperature. Cover the frosting, and store in the fridge until ready to use. This recipe looks absolutely to-die-for delicious! 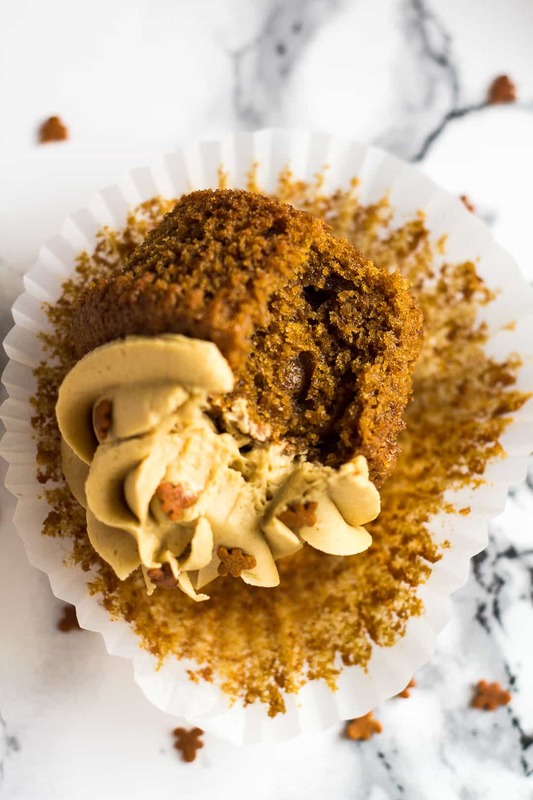 I am a HUGE gingerbread fan, so these cupcakes totally have my name written allll over them 😀 Your photos are absolutely gorgeous as well, and are totally making my mouth water! Also really loving those adorable gingerbread man sprinkles – where did you get them?? So glad I just came across your blog and found this recipe! Most definitely bookmarking! I’m getting ready to whip up a gingerbread cake Marsha. ..so this tip on molasses couldn’t be more timely. Oh. . .and these cuppies. . .they look so light and airy. The perfect little treat to wind down with after a day of holiday gorging. Just made 2 batches. Did the taste test and I’m thrilled with how they came out. They’re really quite spicy which I love. Used good ole’ fashioned black treacle as I didn’t have time to drive to town and get molasses from the health food shop and it works really well. The buttercream is great too. Can’t wait for the family to try them tomorrow. Merry Christmas! P. S. I appreciate the metric measurements as well as the US cup ones. Pam from UK.